To spend or not to spend? That is the question! Last week I drank Grand Cru white Burgundy - Corton Charlemagne, Bienvenues-Bâtard-Montrachet, Bâtard-Montrachet, and Chevalier-Montrachet. A couple of great vineyards were missing from this exalted line-up, but believe me - it was exalted alright! We (as in "wino crowd") all know that 3 things matter - vineyard, vintage, producer. You leave out one of them, and you are as good as a sitting duck. Would you rather have 10 drinkable bottles or 1 great one? I realize that this is a deeply personal question. Is a great bottle worth 5 good ones? Is a divine bottle that is slightly "better" that a great bottle worth twice the price? For that is almost the ratio of a the Bouchard Pere et Fils' magnificent Chevalier-Montrachet ($235) to Bernard Morey's superlative Bâtard-Montrachet ($135). I've thought about it so many times, and still cannot find a good answer, except that I want both! I think it's a philosophical question that applies to everything in life, not just wine. Is one great programmer worth 10 mediocre ones? Well, opinions differ, but even in the age of Google and Apple, their wunderkinds don't get paid even twice of what an average programmer gets paid elsewhere. But back to wine, the quality/price scale is anything but linear. More like exponential. A fractional improvement in quality will double the price. Seems like it shouldn't be worth it, right? But then why is that Chevalier-Montrachet haunting me? A couple of words on the difference between the two neighboring vineyards. First off, before anyone goes defending modern California wines and dissing French, you owe it to yourself to taste a good Bâtard or Chevalier at least once. Assuming your palate has even the roughest ability to differentiate tastes, I think that once and for all, you will stop defying the truth about who makes the best dry white wine in the world! Second, it is a fascinating study of grape to think that two vineyards located on the same hillside, growing the same exact grapes, vinified in generally the same method will produce wines that taste so different. It's called terroir, baby - we all say it, but a tasting like this really makes you feel it. Grape seems to be an amazing conduit of the nutrients in the soil underneath, fueled by the energy of the sun above. And that is the difference between Chevalier-Montrachet (top of the hill) and Bâtard-Montrachet (bottom). Both wines are gorgeous. Both make heads turn when they enter the room. But if I may offer a visual comparison, they are Mr. and Mrs. Smith! 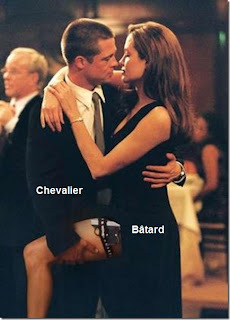 Chevalier - muscular, reserved and classy. Bâtard - more flowery and fruity, voluptuous, round and feminine. Which one do you want? Hidden away in the Town & Country Plaza at the entrance to Stanford University in Palo Alto is a little gem of a cafe called Douce France. The type of place which to me embodies everything best about Palo Alto - quality without pretense, sophistication so subtle that you'll never see it, yet it's in the relaxed air all around you. At first, it may look like any other cafe, until you sit down, relax, watch and listen. You start hearing French, Italian, Spanish... you are in Europe. A perfect savory crepe arrives, and a panini, and a latte so good you've never had it this good within 6000 miles of here. Chef Donato stops here every morning on his way to Donato Enoteca for that perfect cup of espresso. From behind the counter comes Victor, his pale face tired of sleepless nights - he just had a baby. A face of an immigrant who escaped, a face of an angel who has seen hell, and is here now to give the rest of the world a little piece of the sunshine emanating from his soul through his dark, deep eyes. My wine tennis posse stop here almost every Saturday after tennis to wind down and reflect on the week gone by. Oh yes, my tennis posse - a tennis group I run where only wine friends are allowed, most of us techies too! I created my own little nexus of food, wine, tennis, and tech utopia - however unlikely a combo, it is in fact yet another reason why I so love Palo Alto. Hours go by leisurely, life slows down, Victor keeps our plates full, stories flow, fantasies about things we'll never really have the gumption to do, and we savor our blessings.